by harmful free radicals from foods you eat, regular body processes, and environmental pollutants. Higenamine HCL: Derived from plants such as bamboo, the stimulant causes the heart to contract at a faster rate, which can boost athletic performance by increasing blood and oxygen flow to muscles. Schisandra Extract: This ingredient can help reduce stress while upping endurance, performance, and energy. Adaptogens such as this work by recharging adrenal glands, which are responsible for counter-acting the compounds released when stress is high. L-Taurine: Taurine is an essential amino acid with many important functions. While your body can produce it, it’s important to get adequate levels through the diet. Taurine may help act as a fat metabolizer. It also can aid in brain health and boosts short-term focus and muscular endurance. L-Carnitine: Carnitine is another amino whose main role is as a fat metabolizer, working to help burn fat cells for energy at a faster rate. It can also help athletic endurance by lowering lactic acid buildup and maintaining creatine-phosphate levels. Raspberry Ketones: Derived from fruits and veggies such as kiwi, peaches, and grapes, this compound works to break down fat cells and helps increase your metabolism, while also helping to curb your appetite. 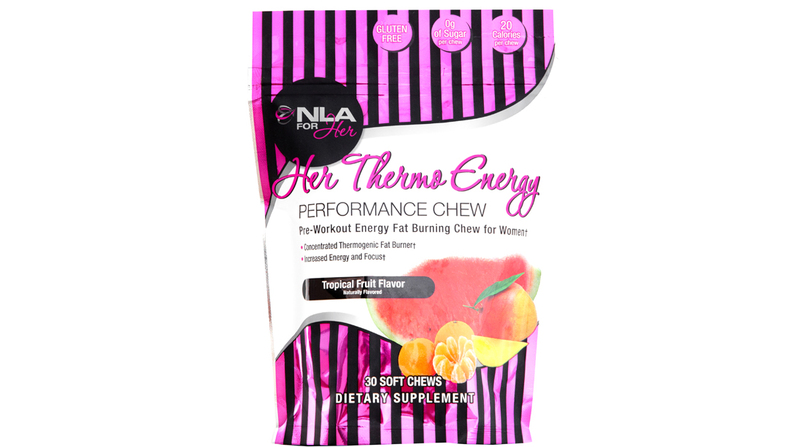 The Her Thermo Energy Performance Chews from NLA for Her contains 55mg of caffeine per chew plus other fat burning and energy-boosting ingredients into soft, small chews that make it a perfect pre-workout snack. Take one 20 to 30 minutes before exercising to increase your energy and focus during your workout.